In Port Macquarie the next morning, Cédric and I cycled down from our campsite to the city center and then over to the Settlement Point Ferry. 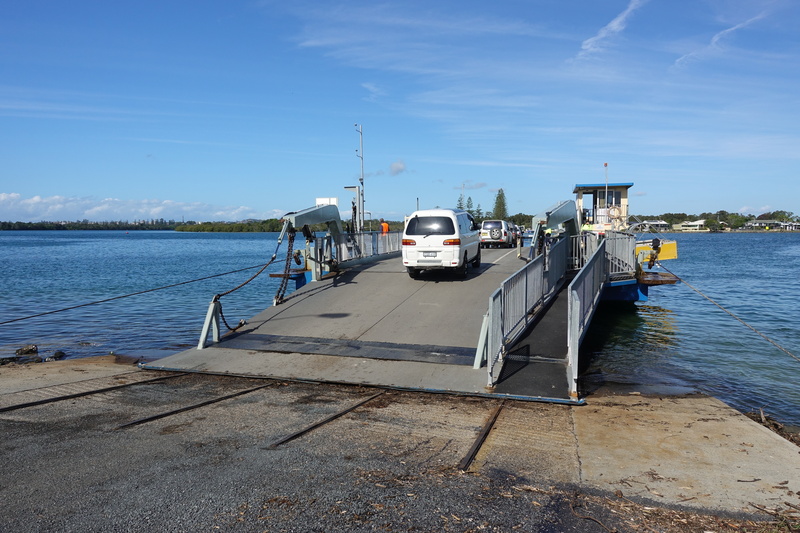 As we boarded the ferry to cross the Hastings River, one of the ferry operators who was interested in our journey gave us heaps of tips for the roads that we should take that day along with places we should visit. 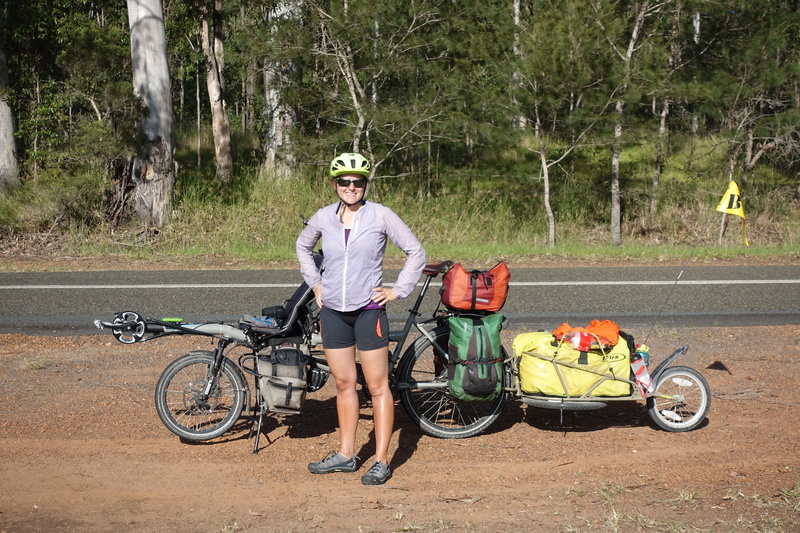 We followed his suggestions, which took us down a quiet dirt road following the Maria River. 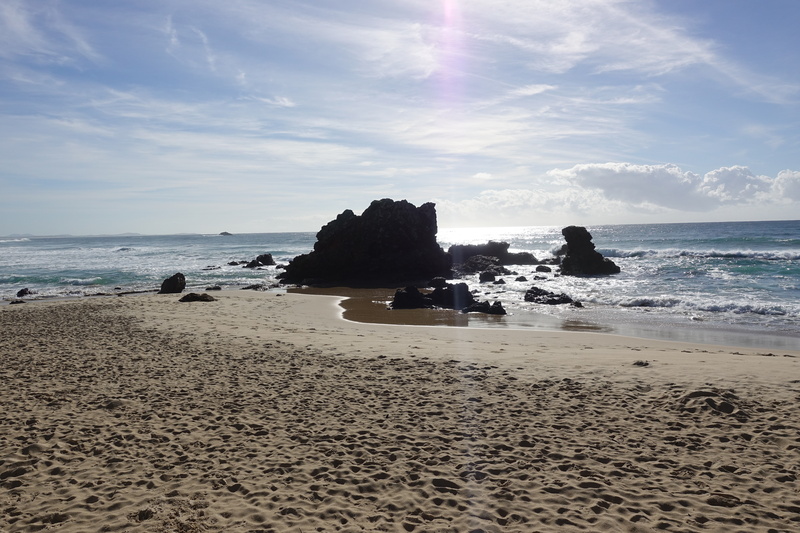 Lunch was on the beach at Crescent Head where we sat on the white deserted beach and watched the waves roll in. 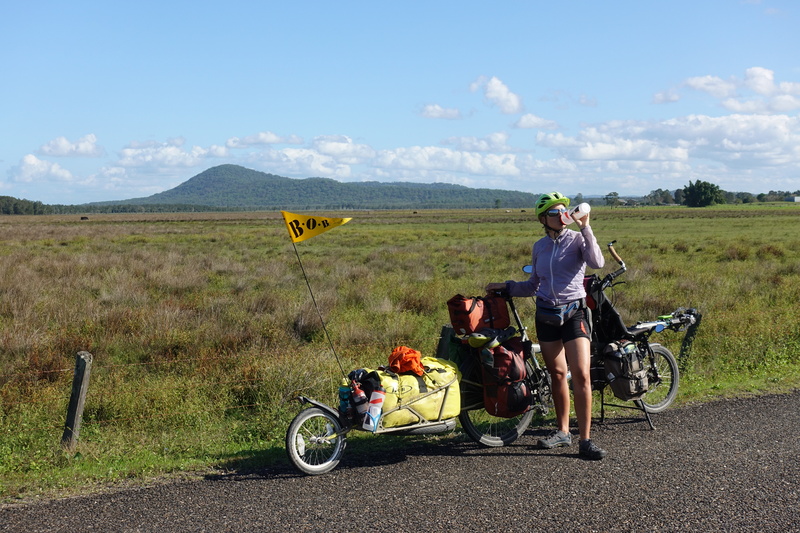 In this stretch, the coast is getting quieter as we ride away from Sydney and Newcastle. Afterwards, we made our way up towards Gladstone and pondered where we would camp for the night, since there was nothing in the area. We talked to a local butcher, who told us of a bit of land on a small hill that cattle ranchers use when their fields flood, so we went there. However, he forgot to mention that the area was infested with mosquitoes (the “Mossies”), thus much of the evening was spent hiding in the tent. 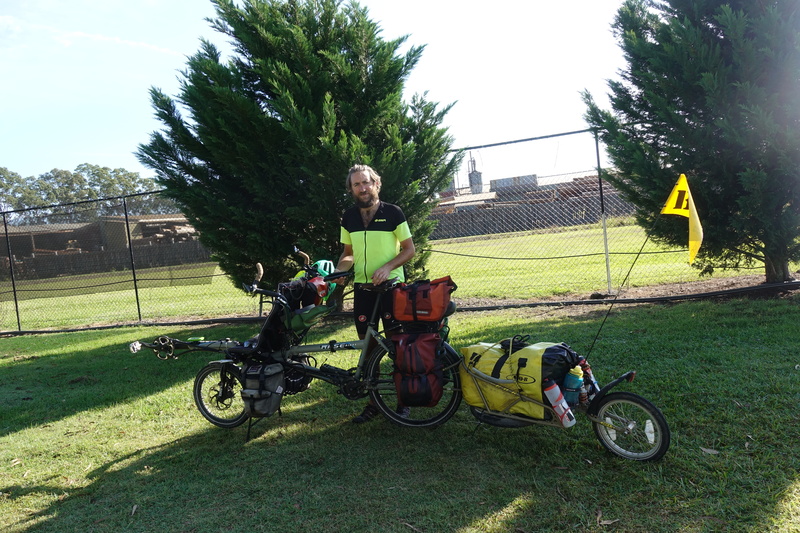 After quickly packing the bike the next morning, Cédric and I joined the Pacific Highway for a few kilometers before turning off on a much quieter road that lead towards Macksville. 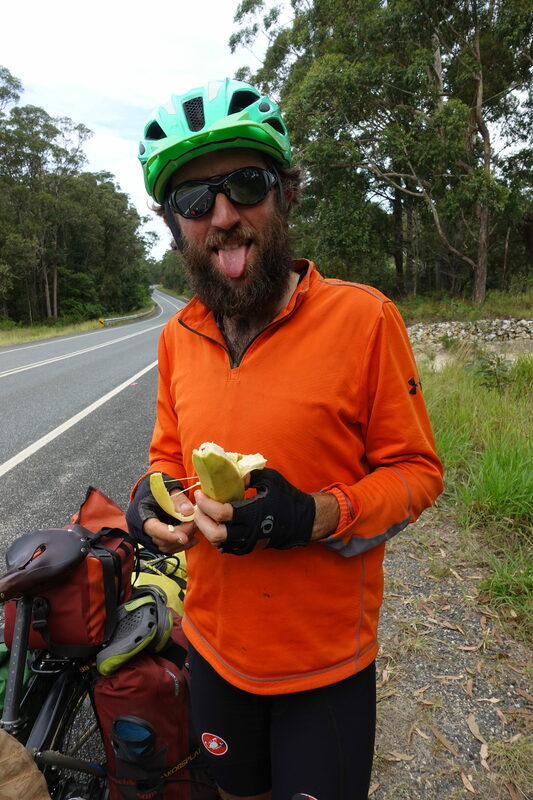 As we continued north, it became very apparent that we were entering a tropical climate because we passed by multiple road side stands selling coconuts, pineapples, and bananas. At one spot, we stopped to buy some bananas from a field, but we chose ones that weren’t ripe enough – which was a surprise for the first bite – a mouthful of banana flour! 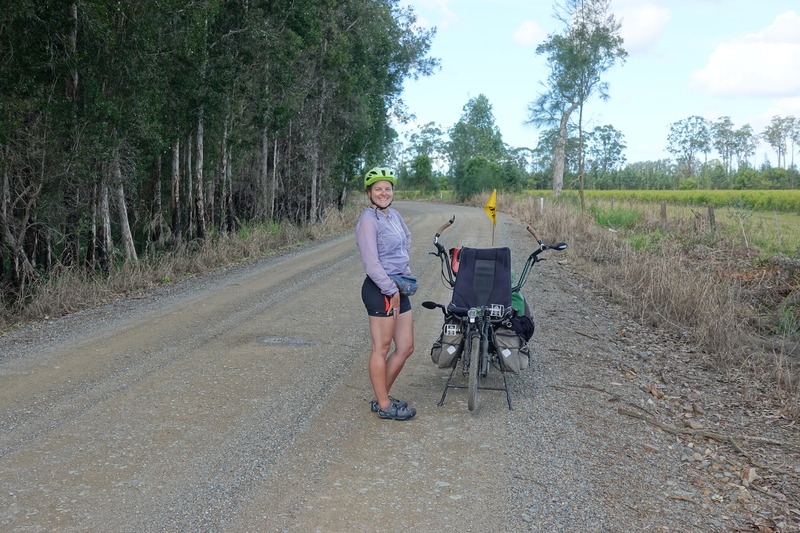 It was along this stretch of road, between Macksville and Coffs Harbor that we noticed an uptick in koala crossing signs but didn’t see one (we had very little hopes of spotting them on 30m high Eucalyptus forests, while riding our bike). 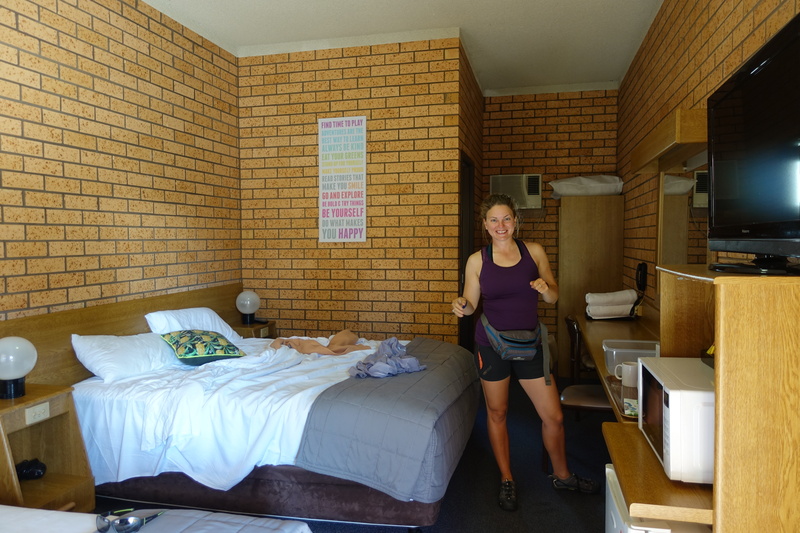 We treated ourselves to a motel that night, but we couldn’t quite kick our camping habits and Cédric got yelled at for cooking noodles on the stove outside of our hotel door: apparently, it’s okay to do a BBQ in an Australian motel, but not to boil water for noodles. 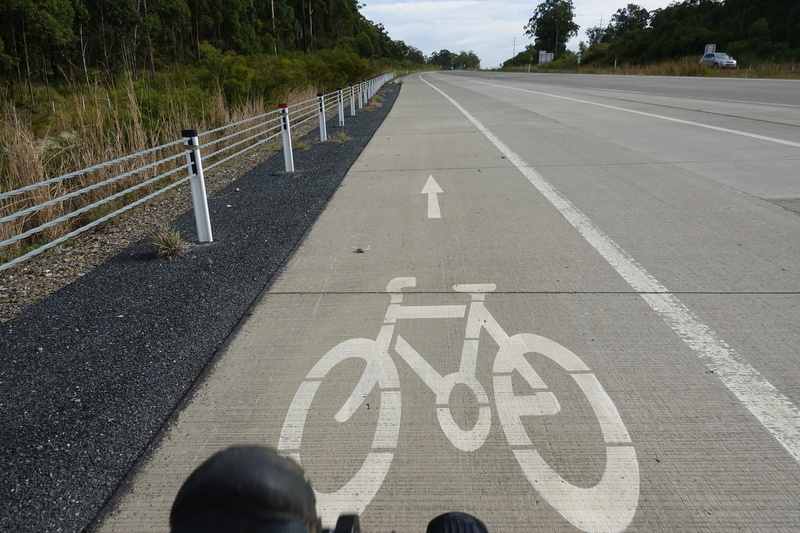 The bike lane on the highway… we’re not the only ones doing this! We go bananas for farm stand bananas! 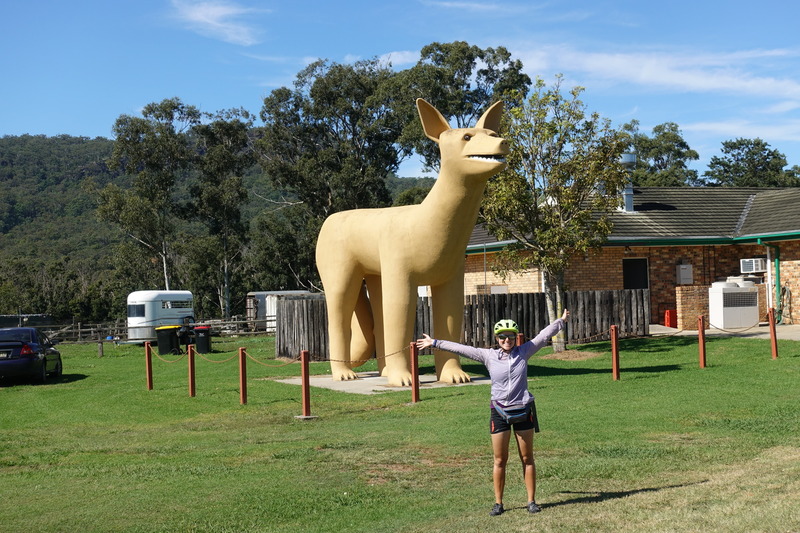 Although our initial plan was to continue cycling up the coast, we noticed that there was no highway shoulder on our way into Coffs Harbor (we noticed this from a bike path next to the highway). 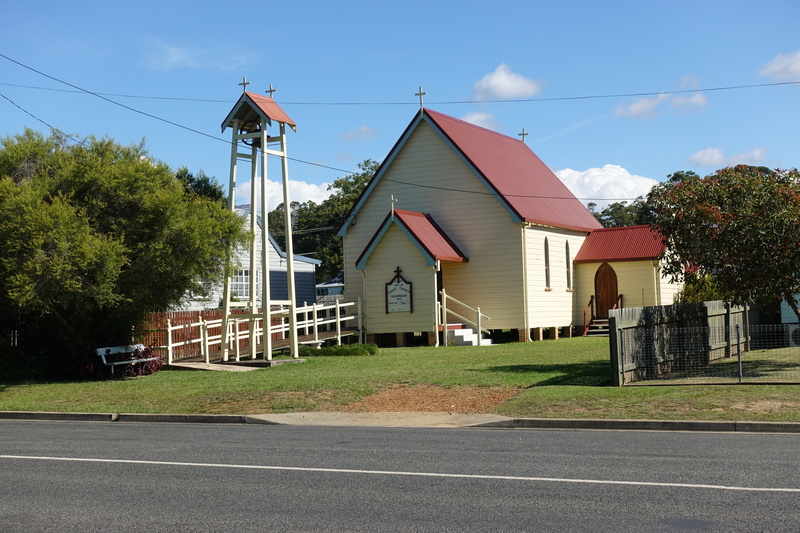 Instead of attempting another few kilometers on the highway, which was unavoidable on the coastal route into Grafton, we decided to take the inland route, which was a hillier option. Taking the inland road also meant staying away from the coast almost all the way to Gold Coast the next days. 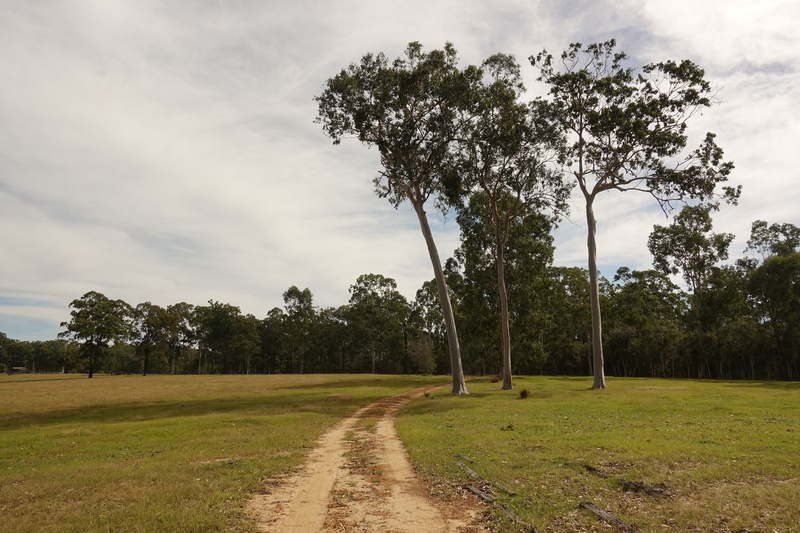 From Coffs, the tropical vegetation melted into eucalypt forest as we passed by many small towns along the way. 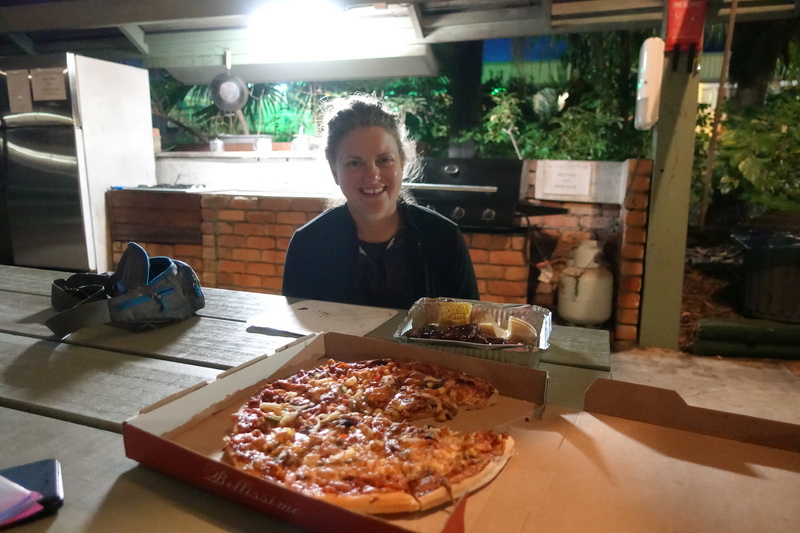 Since the day cycling was exceptionally long and hilly, we treated ourselves to ribs and pizza which we had delivered directly to the tent in a corner of the campground (somehow one more night of noodles doesn’t sound so great when you’re exhausted). The next day, we decided to continue avoiding the highway by cutting inland once again in the direction of Casino (although no casinos there). 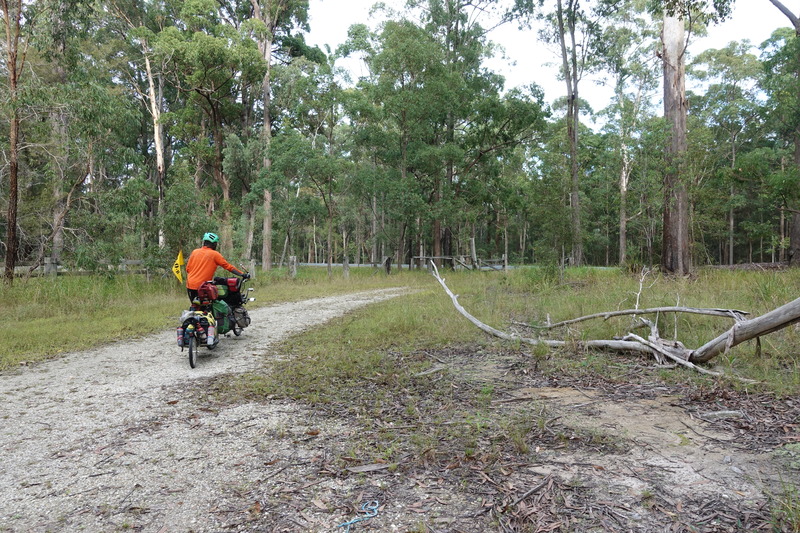 To reach Casino that day, we needed to cycle well over 100 kilometers through uneventful eucalypt forests. Sometime while cycling, we caught the attention of an old surfer hippy who stopped twice to take pictures/videos of us from the side of the road. After the second time he stopped to take pictures, I told Cédric to stop so we could jokingly ask him for beers in Casino. 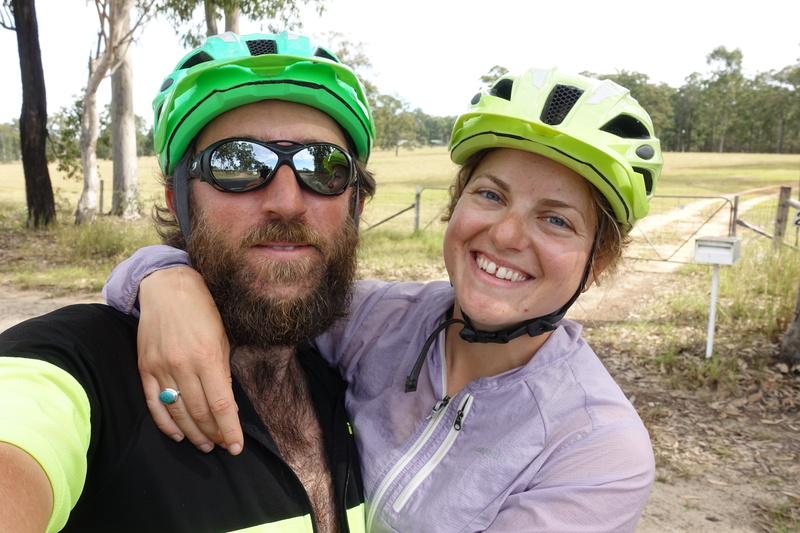 (Whenever we are filmed while cycling, I tell Cédric that the person owes us a beer/coke/coffee because they were doing this without asking us). 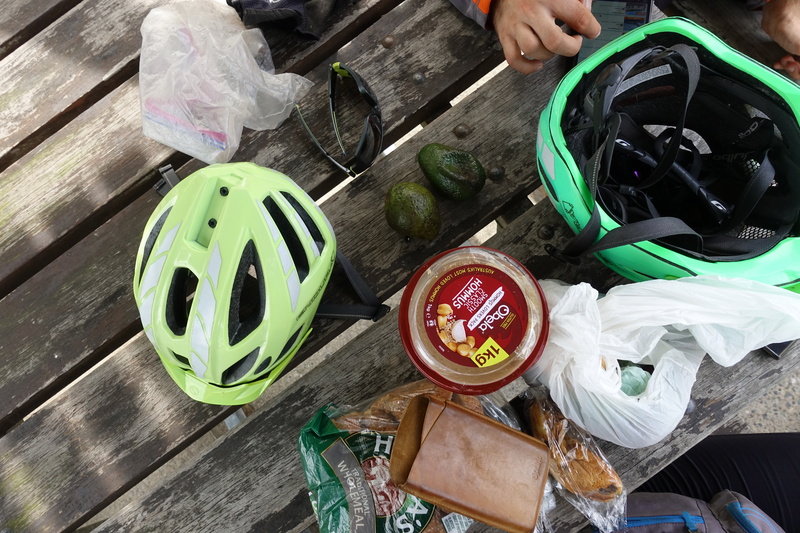 As I got off the bike and approached the guy, he immediately knew what I was after and gave us a bag of kale chips and handfuls of almonds from a garbage bag (he told us that he takes the bag with him when he surfs, so he can snack in the water). 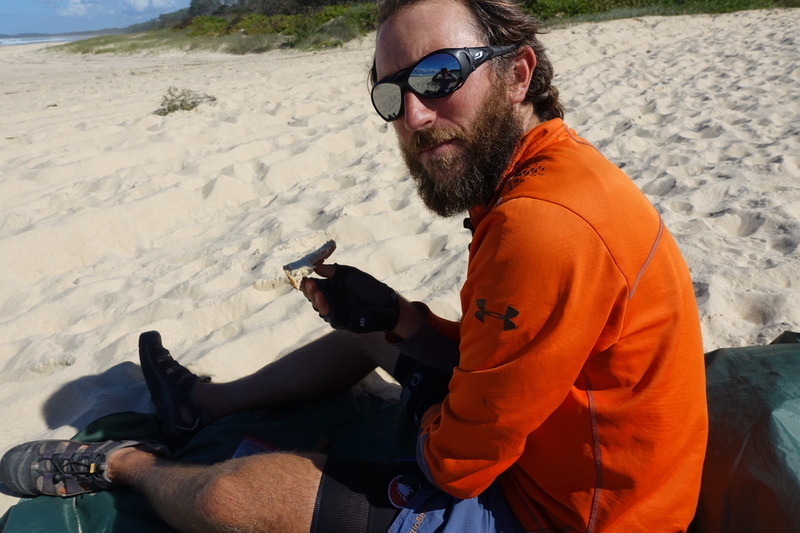 We also got into a discussion (at least tried) with him about our route for the next few days and he started rattling off the names of towns and his tips (ex. 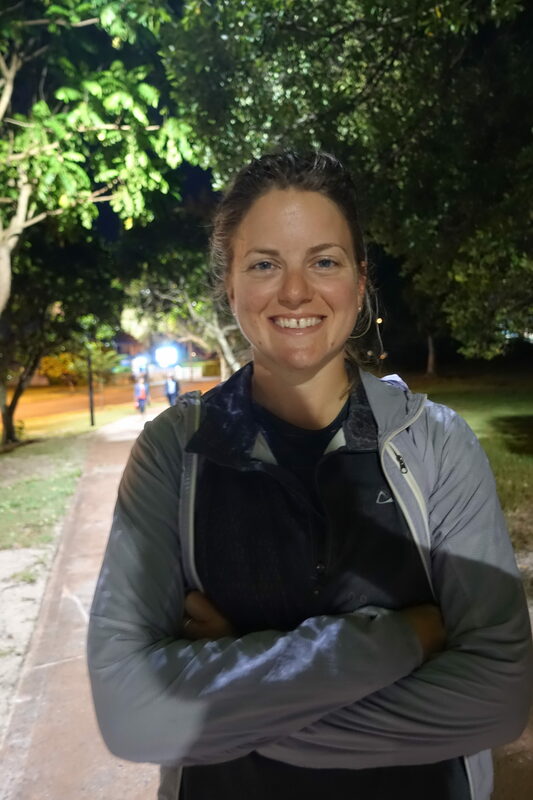 “the Gold Coast is pretty freaky,” “the Hare Krishnas have a Sunday feast in Murwillumbah,” and something about Mullumbimby). He then continued a 10min monologue about towns in the area that sounded to us more like funny sounds then anything we would remember on a map “you should go to bimbim bulum bambalam wolom and bulumbimbi…”. He continued his performance, never looking at either of us but instead always looking up the trees, which made us think that he was also probably expert in local funny mushrooms and was most likely talking to our auras. To break his monologue we told him that we really had to leave before sunset. Since we were sure his mind might have been medicinally altered at that point, we let him drive off first before we continued riding our magical rainbow machine to Casino, where we stayed at a campsite that was hosting the Australian Avan caravan annual meetup. Always looking forward to reading your posts! Thank you for the updates!